Connect your desktop computer to a dual-band wireless network with the D-Link Wireless N 300 Dual Band PCI Express Desktop Adapter (DWA-566) to maximize the speed and range of your wireless signal. Ideal for streaming HD videos and lag-free gaming, the Xtreme N Dual Band Desktop PCI Express Adapter uses the clearer 5GHz band for media streaming to avoid interference and deliver optimal performance. 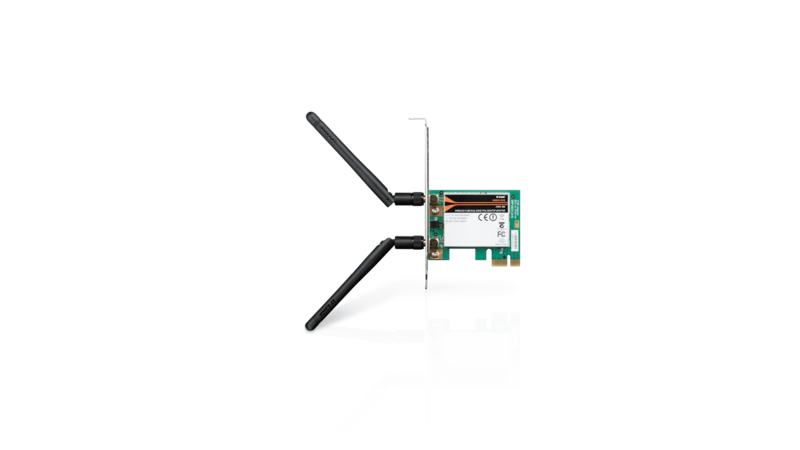 The D-Link Wireless N 300 Dual Band Desktop PCI Express Adapter with Wireless N technology maximizes the speed and range of your wireless signal to significantly outperform Wireless G devices1. The DWA-566 fits into any standard PCI Express slots – x1, x4, x8, or x16. The Wireless N 300 Dual Band Desktop PCI Express Adapter is powered by Wireless N technology and uses two external antennas to provide superior wireless reception in your home or office. This adapter is designed for use in larger homes and offices, or for users running multiple bandwidth-intensive applications. This adapter enables you to simultaneously make or receive Internet phone calls (VoIP), surf the Web, transfer files, and stream High-Definition (HD) media when connected to an Xtreme N Gigabit Router (DIR-825 or DIR-855). The DWA-566 supports WPA™ and WPA2™ encryption that allow you to connect securely to a wireless network. The dual band N technology in the DWA-566 supports selectable 2.4GHz or 5GHz wireless signals. This allows you to check e-mail and browse the Internet using the 2.4GHz band or stream HD movies and other media on the 5GHz band. The 5GHz wireless band is the best technology available for wirelessly streaming HD videos across your network. It achieves this by operating in a clear wireless band to help avoid interference that may slow down and limit the range of current wireless technologies like 802.11g2. The DWA-566 is also backward compatible to 802.11g, which means it can be used in existing 802.11g networks.